Google already knows if a page is part of a discussion group and it also extracts useful information like the number of posts or the date of the most recent post. Now Google started to cluster forum threads and to show related discussions below some results. Google uses a similar technology for Google News, where news articles from more than 25,000 sources are categorized based on their similarity. For now, this is just an experiment, so only a small percentage of Google's users will see the enhanced results. It didn't work for me when I tried to search? Is this because I use localized version of google search? 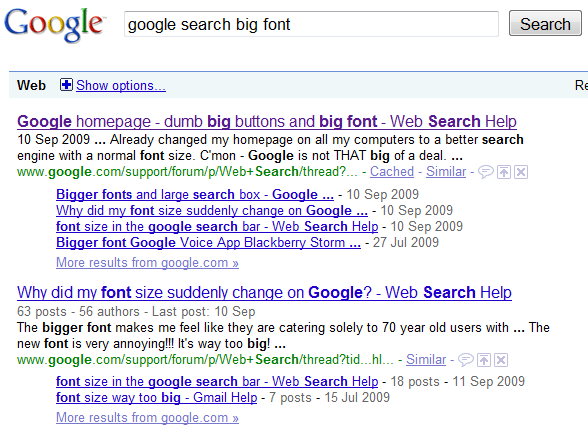 For now, this is just an experiment, so only a very small percentage of Google's users will see the enhanced results. That's great..!! Now forums will create a clustered results in the ranking of keywords for sites..!! Its really awesome..
this is a great idea. would really make a significant impact on most people's every day searching i think to group all the forum hits. i mean forum info can be alright but sometimes they can be annoying. I've been receiving this new result view, however, not for forums but for blogs as well; related blog posts appear as the smaller links. Good god this will be such a useful feature! So many times i have went to a forum through some other thread to search for the thread i wanted, now a bunch of related ones will save so many useless clicks and resources thanks to the stats on the threads. I try but I can't get best result? Am I make some wrong on search?